The Royals have added some versatility to both their infield and outfield mixes, announcing the signing of former D-backs utility man Chris Owings to a one-year contract for the 2019 season. Owings, a client of ACES, will reportedly receive a $3MM guarantee and can earn another $500K worth of incentives. On the surface, this seems to be quite a sensible match for all involved. Owings, 27, is a nice bounceback candidate who could see action all over the field in Kansas City. He was recently non-tendered by the Diamondbacks, who elected not to pay him a projected $3.6MM. As Owings has already topped five years of MLB service, the Royals won’t have any future control rights to look forward to. He’ll once again be a free agent next winter. Owings has spent most of his career playing up the middle in the infield, though he also has spent plenty of time in the outfield (right and center, primarily) and has logged some innings at third base. Unless he’s offered a chance to earn regular time at the hot corner, or a trade creates space elsewhere, odds are he’ll be tasked with moving around quite a bit in Kansas City. The organization is slated to cover most of its middle-infield innings with Adalberto Mondesi and Whit Merrifield. Owings can support that middle infield pairing while buttressing the Royals’ roster at the other spots where he has experience. The Royals third base situation remains largely unresolved at present. Meanwhile, K.C.’s three top outfielders (Alex Gordon, Brian Goodwin, Brett Phillips) all hit from the left side, making Owings a natural platoon match (though he has mostly neutral splits in his career). The defensive flexibility is obviously nice, particularly since Owings has graded well at second and fantastically in the outfield. He’s not exactly a defensive-metric darling at short, but he can clearly handle that spot as well. All said, there should be plenty of opportunity for Owings — supposing, at least, that he can turn things around with the bat. While he has at times shown an ability to hit at or at least near the league-average rate, Owings is coming off of a dreadful 2018 campaign in which he slashed just .206/.272/.302 with four home runs and 11 steals over 309 plate appearances. To be sure, Owings was likely somewhat unfortunate to post a .265 batting average on balls in play last year. But he didn’t exactly knock the socks off of Statcast’s fancy machinery, with his batted-ball profile spitting out only a .281 xwOBA. That did land well above his .251 xOBA, but it also represented the fourth-straight season in which Owings fell below .300 in xwOBA. It’s tough to find much to love about Owings’s recent track record offensively. His walk rate did tick up to a personal-high 7.8%, but he also struck out at a 24.3% rate. Owings’s in-zone contact rate fell to a personal-low 85.9%. Meanwhile, he put the ball in the air much more than ever before (38.3% FB rate) without the dingers to show for it (5.1% HR/FB). Of course, the Royals won’t need Owings to produce even at a league-average rate to see a return on this contract. If he can return to being a slightly below-average bat, Owings will meet the loftiest realistic expectations of his new organization. Robert Murray of The Athletic first reported the agreement (via Twitter). Jon Heyman of Fancred (Twitter link) and Jeffrey Flanagan of MLB.com (Twitter link) provided details on the terms. Reflecting on his six-year tenure with the Rangers, impending free agent right-hander Yu Darvish told Evan Grant of the Dallas Morning News via text (through an interpreter) that he “listened and paid too much attention to any criticism I heard inside and outside the clubhouse” when he was a member of the team. Darvish also revealed that his relationship with his Rangers teammates “wasn’t great” at times. Those issues sapped Darvish of some of his joy for baseball, though he noted that he began regaining it after the Rangers traded him to the Dodgers on July 31. Darvish explained that his loss of enthusiasm wasn’t the fault of his previous club, however, as he came to realize “how much the Rangers and the fans cared about me” while in LA over the final three months of the season. Although Michael Brantley missed a large portion of this past season with right ankle problems and then underwent surgery Oct. 19, the Indians still picked up his $12MM option for 2018 on Friday. When discussing the decision with Ryan Lewis of Ohio.com and other reporters, president Chris Antonetti noted that Brantley’s surgery carries a high rate of success (Twitter link). While the Indians are optimistic about Brantley’s health, Antonetti won’t talk about how the 30-year-old fits on the Tribe’s roster until he’s further along in his rehab, per Lewis. Diamondbacks infielder/outfielder Chris Owings underwent surgery on his right middle finger on Friday, the club announced. Owings previously had surgery on that same finger July 31, a day after he suffered what proved to be a season-ending fracture. The latest procedure “was performed to ensure continued proper and complete healing,” the D-backs stated. Bobby Henley will stay on as the Nationals’ third base coach under new manager Dave Martinez, Chelsea Janes of the Washington Post reports (Twitter link). As Washington’s third base coach since the 2014 season, Henley has survived the ousters of skippers Matt Williams and Dusty Baker. Diamondbacks shortstop Nick Ahmed has been diagnosed with a broken right wrist, as Nick Piecoro of the Arizona Republic reports. He was hit with a pitch during a rehab appearance. That’s brutal luck for Ahmed, who was nearing a return from a long layoff owing to another HBP that resulted in a broken right hand. Another key middle infielder, Chris Owings, is also on the DL, though Piecoro notes that the hope is that he’ll be able to return at the tail end of the regular season. In Ahmed’s case, he is expected to require six to eight weeks to recover. In theory, then, he could be ready to return during the postseason, should the Diamondbacks qualify and advance. But it’s likely that this injury will spell the end of Ahmed’s season. The 27-year-old has only taken 178 plate appearances on the year to date, slashing .251/.298/.419 in advance of his first season of arbitration eligibility. He’s a gifted defender, though that won’t really boost his earning power through the arb process. Arizona has relied upon youngster Ketel Marte to cover for the injuries. He carries a solid-enough .256/.342/.419 batting line and has taken strides in his plate discipline (11.4% walk rate). Marte figures to continue occupying a significant role the rest of the way. There are still a few days left to try to swing a trade, of course. Reds shortstop Zack Cozart standing out as a hypothetical target, though his waiver status is unclear. GM Mike Hazen tells Piecoro that he’ll continue to look into the possibility of a swap for a middle infielder, but he also downplayed the likelihood of finding a match. 7:42pm: Arizona is “unlikely” to shop for another infielder, per Ken Rosenthal of MLB Network (via Twitter). The club thinks its depth is sufficient, particularly with Ahmed expected to return within a month or so. 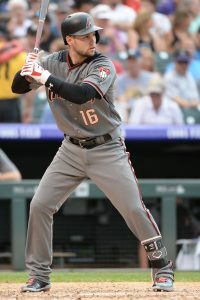 4:41pm: Diamondbacks infielder Chris Owings has been diagnosed with a fractured middle finger on his right hand, Nick Piecoro of the Arizona Republic tweets. While details on an anticipated course of treatment and timeline aren’t known, he’ll obviously be out for a reasonably extended stretch. With Owings joining Nick Ahmed on the DL, the D-Backs are left with quite a bit less middle-infield depth than they had to open the year. Ketel Marte and Brandon Drury look to represent the top two options on the active roster, with Daniel Descalso also available in a reserve role. The loss hits the Snakes at an interesting time, with the trade deadline less than 24 hours away. Whether Arizona will feel any major new impetus to pursuing a trade remains to be seen. Owings is now in a state of uncertainty and Ahmed has yet to begin a rehab assignment. But Marte has played well since returning to the majors and Descalso won’t be needed as much in the outfield as he was at times due to the recent addition of J.D. Martinez. If the D-Backs do take a look at the market, they could consider a variety of options. MLBTR has recently assessed the potentially available shortstops and second basemen. Among those of note are Zack Cozart of the Reds, though he just landed on the DL. Jose Iglesias of the Tigers would represent a controllable piece and is capable of providing top-notch defense at shortstop, though he has never been much with the bat. If the Diamondbacks don’t feel they need a player capable of lining up at short, they could focus on rentals such as Jed Lowrie of the A’s or Neil Walker of the Mets. As ought to be apparent from some of the names mentioned, there may not be much rush to finding a replacement. Arizona may prefer to see how its injured players progress while waiting to weigh new acquisitions over the month of August. Cozart figures to be available then, and Walker may be as well given that he only just returned from the DL and is earning a big salary. Veterans such as Brandon Phillips, Asdrubal Cabrera, and even Ian Kinsler are also plausible chips that could last past tomorrow’s non-waiver deadline. 10:00am: Dennis Lin of the San Diego Union-Tribune tweets that the Padres have had past interest in Ahmed and points out that San Diego manager Andy Green knows Ahmed well from his time as the Diamondbacks’ third base coach. 9:44am: The Diamondbacks’ offseason infield additions (Ketel Marte and Daniel Descalso) and the spring emergence of Ildemaro Vargas (who is currently on the 40-man roster) have created a willingness to listen to offers on defensive standout Nick Ahmed, reports Nick Piecoro of the Arizona Republic. According to Piecoro, Chris Owings has the inside track on the Opening Day shortstop gig right now, further prompting the team to explore options with its infield depth. The 27-year-old Ahmed does have a pair of minor league options remaining, so there’s no urgency for Arizona to move him prior to the end of Spring Training. Ahmed underwent season-ending hip surgery last August but has looked healthy this spring, per Piecoro. Thus far, Ahmed has appeared in 13 games and is tied for the most at-bats of any player in Diamondbacks camp. He’s hitting just .250/.263/.389 in that small sample, though spring stats are always best taken with a grain of salt, and Ahmed’s value is derived from his glove as opposed to his bat, anyhow. In parts of three big league campaigns, Ahmed is just a .221/.268/.329 hitter over the life of 842 plate appearances. While that level of offensive output is hardly appetizing, Ahmed also grades out as one of the game’s truly elite defenders, however. Ahmed has logged 1920 innings at shortstop in his Major League career and has posted outstanding totals of +34 Defensive Runs Saved and +20 in Ultimate Zone Rating. That premium glovework could make him appealing as a bench option, at the very least, to other NL clubs that lack the Diamondbacks’ considerable depth at shortstop. If the D-backs are to find a taker in a trade for Ahmed, a bench role on another club seems the likeliest outcome for him, from my vantage point. That, however, has more to do with the fact that there simply aren’t many teams looking for starting shortstops than it does with Ahmed’s overall ability. The Padres are known to be looking for shortstop help and have reportedly inquired on both Jose Iglesias and Zack Cozart this winter, making them one speculative club that could look to Ahmed as a candidate for more regular playing time. Of course, there’s also the matter of dealing with a division rival, which can often complicate matters. San Diego currently has Luis Sardinas and non-roster invitee Erick Aybar as its top two shortstop options in camp, so there’s certainly room for Ahmed to join the fray and compete for playing time. Ahmed has not yet reached arbitration eligibility in his still-young career, so he’d be eminently affordable for the upcoming 2017 campaign. He’ll be a virtual lock for arbitration next offseason so long as he spends at least 86 days in the Majors in 2017, though his limited offensive contributions should keep his price tag down even if he does reach arb. Ahmed can be controlled through at least the 2020 season, so he could be a cost-effective depth option for any club looking to bolster its infield defense in both the short and long term. Given his defensive prowess at short, it stands to reason that Ahmed would be well-equipped to handle both second base and third base as well.